Window Energy Rating - Can it help lower your fuel bills? The Window Energy Rating (WER) label scheme was launched in the UK by BFRC. They are a Government supported independent body. The details shown on the Energy label helps buyers to compare one product with another. You can then make good choices about the energy performance of a window. The A+ (best) to G (worst) rating system is similar to the labels already used on white goods. BFRC rated energy efficient windows and energy efficient doors carry a ‘rainbow’ label. This is similar to those found on fridges, freezers, washing machines. If you install energy efficient doors and windows you could make significant savings on your energy bills. Being able to reduce our energy bills helps reduce the carbon emissions from our homes. This is why making our homes more energy efficient is now more important than ever. For many homes fitting double glazing is an great way to lower their energy bills. PVC-u, Aluminium and Timber windows can all be supplied with an A+ Window Energy Rating. The Energy Saving Trust suggest you could make large savings over the typical life time of Double Glazing. 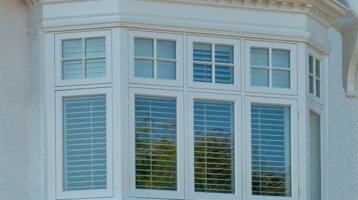 Cheam Windows are trusted local installers of Windows and Doors in Surrey, London and the Home Counties. We have over 25 Years of experience and thousands of happy customers. Cheam Windows can install A+ rated Windows and Doors for you. For more details and to see our huge range of Double Glazed Windows and Doors, visit our Showrooms in Banstead, Hampton Court and Worcester Park. We would be delighted to see you !